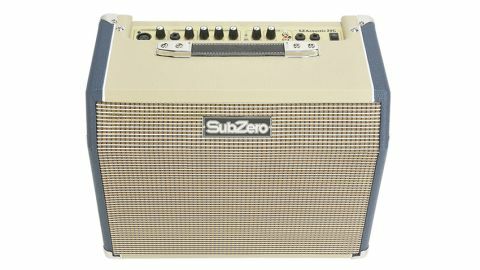 Its excellent performance and great price make the SubZero 25W Acoustic Guitar Amp with Chorus a hot deal. Cool looks. Great as either a bedroom amp or an on-stage monitor. Bargain price. No depth control on the chorus. Non-detachable power lead. When it comes to electro-acoustic amplification, there are two givens: electro amps are expensive compared to their electric guitar counterparts, and you only need to plug straight into the PA if you want to play a gig. The Subzero 25W Acoustic Guitar Amp with Chorus proves both these assumptions wrong. From the off, this combo is impressive. Its classy styling belies its budget friendly price. It oozes classic, retro cool thanks largely to a cream grille and top with navy Tolex sides. An angled top at the front hints at the SubZero 25W's ambitions of being more than just a practice amp - you could also use it as a monitor for your sound at gigs. The potential for this combo to be your gigging friend on the small stage is further underlined by the inclusion of a line-out control that could be plugged straight into a venue's PA. There's even an auxiliary LR input, which means you could jam along to your MP3 or CD player, or even play a backing track. Clearly the SubZero 25W has got it going on features-wise, but how does it actually sound? Impressive, is the answer. A mahogany dreadnought equipped with a Fishman entry-level Sonitone preamp is the instrument given the task of putting the SubZero combo though its paces. We plug it into the jack input in channel two (there's an XLR input for the amp's first channel) and try out the SubZero's three-band EQ settings: bass, mid and treble. All three controls set to '12' proves a good starting point for strumming and provides an inspiring, sparkly zing. Turn the mid up a little and the sound is spot on for some delicate finger-picking. It's so good, in fact, that you have to wonder if you are really playing an amp that costs a very affordable £65. The bass response is also satisfyingly deep, though it's worth noting that this will depend largely on your acoustic guitar and its inherent sound. As is clear from the amp's name, chorus is also part of the package here. While it's good to see an effect such as chorus included on a budget practice amp, the lack of a depth control makes it a frustratingly limited affair. The only chorus parameter changeable with a control knob is the speed, so you're stuck with a rather unsubtle default chorus depth. And as far as the chorus speed goes, anything past five on the dial is probably going to be too much for most of us pickers and strummers. This - and the inclusion of a fixed, non-detachable power lead through the SubZero's closed-back casing - is, however, the SubZero's only significant downside. Though a bit of a lost opportunity, the somewhat-lacking chorus still feels a minor gripe in the bigger picture of this compact combo. If you want to hear your electro-acoustic songs amplified before you brave the stage, then this combo would be just the job to plug into in the bedroom. But its eight-inch speaker easily cranks out enough volume to make it ideal for jams, too. Once you're ready for your intimate acoustic gig, there's the added bonus of being able to use this as a monitor. Just plug straight into the PA and tweak away at your tone. So, multi-use, stylish looks and serious sound performance for a piffling price tag; we'd say that's great value for money.